Shop online for the best bulk spring ring prices in the jewelry trade! Spring rings are the most economic, secure jewelry clasp available. Most of our collection is precision engineered by findings machine manufacturing experts in Italy. They are an affordable finishing solution for lightweight jewelry chains or necklaces. Spring rings can also be used to sell removable jewelry charms. These fasteners contain a stainless steel internal spring for a reliable trigger mechanism that will last a lifetime. Select a diameter that will create a smooth line with your accessory design. 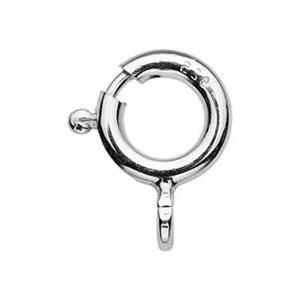 We offer a range of sizes that are appropriate for the necklace weight that spring rings can handle. For heavier pieces, we recommend lobster claws or toggle clasps.